Back in the fall of 2011, I decided to collect a few slugs and snails from my yard to study. I needed to illustrate “Slippery, Stealthy Slugs” written by Susan Carl for Wildlife in North Carolina magazine. Top left to right: white-lipped globe snail, 2 three-toothed snails. Lower left to right: sow bug, and several three-band garden slugs. The three-tooth snails laid a few eggs in the moss and I had tiny snails after a while. The white-lipped globe snail, Globe, was a bold explorer and loved to munch on mushrooms. The juvenile three-band garden slugs were speedy and devoured fresh lettuce. One chilly evening in January 2012, I went outside to bring in firewood and discovered a handsome slug snuggled in the woodpile. I placed it in my terrarium. It was quite different from the non-native species I had collected. Art Bogan, from the NC Museum of Natural Sciences, and Megan Paustian, from the Carnegie Museum of Natural History, helped me identify this native as a changeable mantleslug, (Megapallifera mutabilis) … or Slide for short. The leopard slug was too large, active and slimy to live comfortably in my small terrarium. After drawing, I released the leopard on a holly trunk. This is Slide climbing onto a stick. Here is a sketch of Slide’s face. 2 long eye-stalks look about, while 2 short stalks feel-taste-smell below. Slide’s face looks a bit cat-like, mouth closed. Changeable mantleslugs (Megapallifera mutabilis) forage for fungi and lichen in the tree canopy. I gathered fallen branches with fungi for Slide to eat. These native slugs shelter together in moist nooks and crannies in the trees and under logs on the ground. They stretch way out and twist all about; gliding up, over and under with grace. Mantleslugs sometimes contract into a hard lump when frightened. All slugs breath through an opening, called the pneumostome, located on their right side, shown in my sketch below. 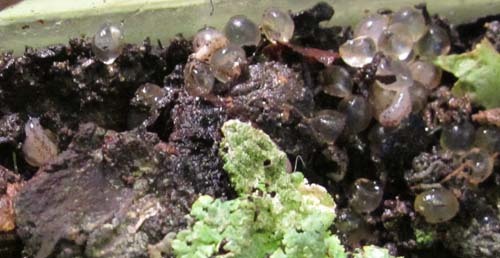 On February 11, 2012 at midnight, Slide laid a cluster of eggs (more than 20) in my terrarium. Then she rested. (I figure I can call this hermaphrodite a female while laying eggs!) Next morning she stretched and nibbled on lichen. Slide laid more eggs on February 26, 2012 and on March 9, 2012 her first eggs began to hatch. Slide lays her second cluster of eggs. The first egg cluster hatches. Baby slugs! Slide and her babies, of various ages, eat together. Slide continued to lay egg clusters for the next three months. Whenever the weather was wet and warm, I would release her babies onto my maple trees where other slugs roamed. I finally released Slide after she laid her sixth egg cluster. At midnight on May 4, 2012, Slide glided up a big wet maple and disappeared in the canopy. Her offspring are growing and doing well. …and huddle together in the backyard. Certain predators are happy to thin the backyard slug herd! Look in mesic wooded habitats (well-supplied with moisture) for these handsome native slugs. In the morning after a rain, you may find them moving down the trees. During the night, look for them climbing up to search for food and mates.